The Stylophone Studio 5 is a project to recreate the original 1968 Dubreq Stylophone which sounds and reacts just like the original (and even contains a replica of the original circuitry) however it also fully supports both MIDI in and MIDI out over USB and can be controlled by studio software such as Cubase. There have been plenty of projects on the web allowing MIDI out from modified Stylophones (which is fairly easy to do since it only requires an ADC on the original keyboard output), however providing MIDI in to the instrument is far more complicated to achieve (which is why versions 1 to 4 never made the grade!). Since the original Stylophone is completely analogue the control circuitry must be carefully designed so as not to interfere with the sound of the instrument. Furthermore the original is 9 volts which means it cannot be directly controlled by a microcontroller. The Stylophone Studio 5 design overcomes these issues and even provides features not possible on the original such as pitch-bend control and automatic tuning. The original 1968 Stylophone was available in three different tunings: bass, standard and treble. 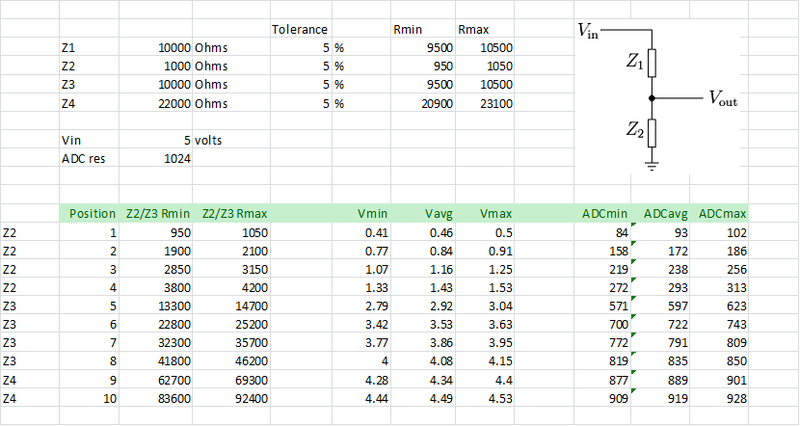 Each of these tunings was implemented by changing capacitor values on the circuit. The Stylophone Studio 5 supports all three models using an automatic circuit reconfiguration. The tuning, vibrato and overall tone output is all controllable via MIDI. Although I do own an original 1968 Stylophone (from which all of the reverse engineering was performed) and it is possible to alter the original for both MIDI in and out (using the same techniques detailed here) I decided it was better to build from scratch as I didn’t want to damage my original in any way. At all stages the audio output from both the Stylophone Studio 5 and the original were compared on an oscilloscope to ensure as much likeness as possible in the sounds. The hardware can be split into 4 distinct sections: the microcontroller, the Stylophone tone generator, the frequency counter and the Stylophone control panel and keyboard. Each one of these parts is described in detail below. 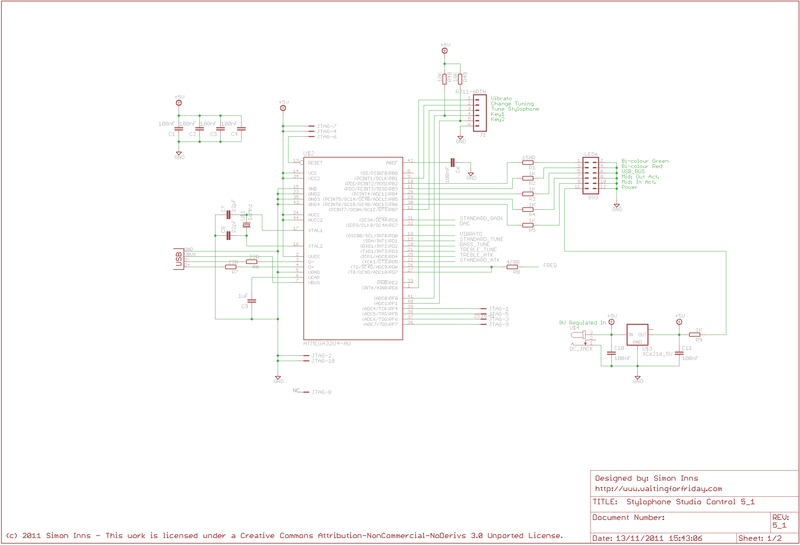 The microcontroller is an Atmel AVR ATmega32U4 which was chosen for several reasons. It has in built USB and can support MIDI using the LUFA USB stack and it has a very high frequency PWM generation which is required as part of the DAC which controls the primary oscillator. 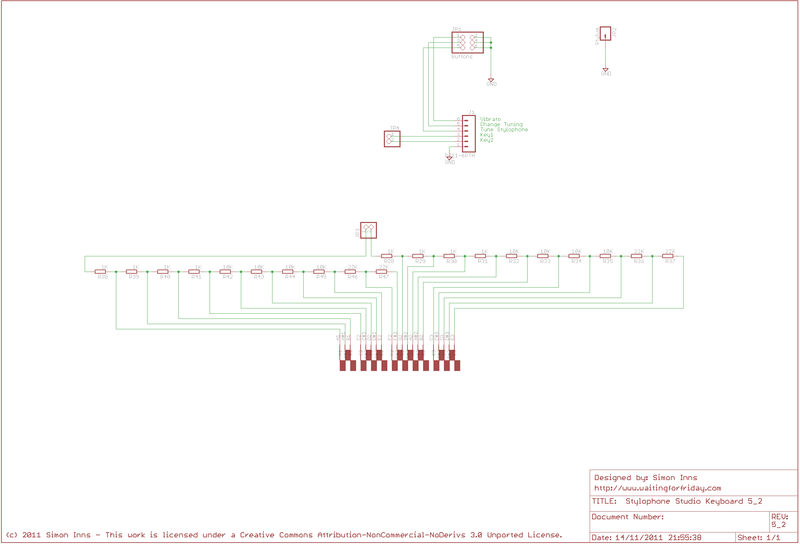 The microcontroller also provides ADCs which are used to read the keyboard to detect keypresses. The microcontoller also connects to the CD4066 analogue switch ICs which are used to provide control between the 5V microcontroller and the 9V Stylophone oscillator. Since the original Stylophone used a resistor network to control the pitch of the Stylophone, the PUT relaxation oscillator is current controlled. So in the design we pass 9Vs through an analogue switch. The analogue switch is controlled with a high-frequency PWM signal from the microcontroller which has 10-bit accuracy (meaning that 0% duty-cycle is 0 and 100% duty-cycle is 1023). Note that the high-frequency (around 94 Khz) is required so that the series resistor and capacitors (already present in the original design) can act as an RC filter to the PWM signal which smooths out the PWM and ensures no artefacts of the signal are present in the final sound. Where Vavg is the average voltage given for Vin and the current duty-cycle (d) in %. Note that the minimum resistance we can represent is fixed by the resistor on the multiplexer’s output pin. 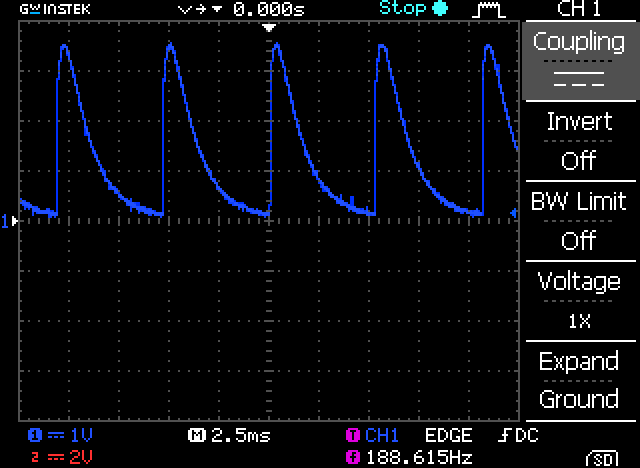 The maximum is dependent on the resolution of the PWM. 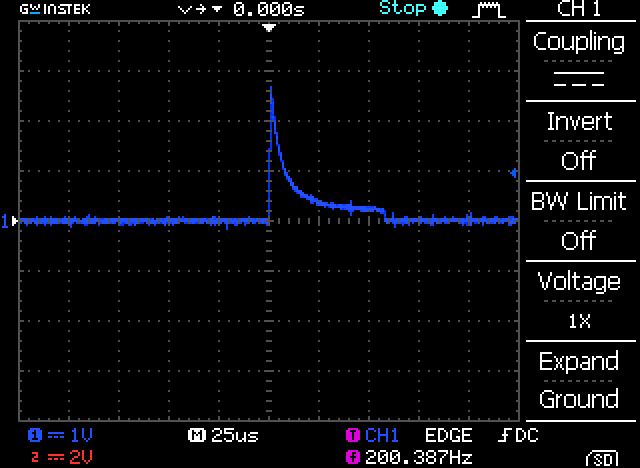 This is then fed into a comparator which converts the triangle-like wave output into a 5V peak square-wave which can drive the microcontroller’s timer input. 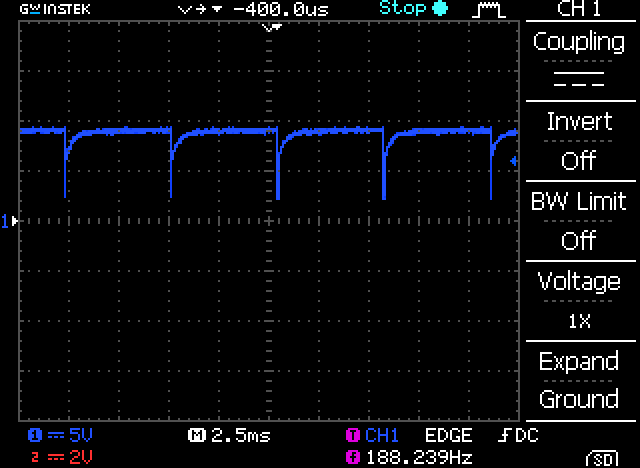 Since the frequencies are relatively low (as they are audio signals) the microcontroller requires a relatively long sample to get an accurate reading (1 second). To ensure it only counts during the 1 second duration a second pin on the microcontroller is used to allow and deny the signal as required. To speed up tuning further it is possible to predict the output frequency from the PUT oscillator for a known PWM duty-cycle however the maths is quite involved. To do this we need to return to my original Reverse Engineering the Stylophone project where I demonstrate how to calculate the possible output frequencies of the Stylophone based on the functioning of the PUT relaxation oscillator, the resistance to 9Vs and the value of the tuning capacitor. For the standard tuning the value of c is 100 nano-farads. This should be represented in farads giving a value of 0.0000001 farads. To make things easier in the code we can produce and simplify three formulas (one for each tuning mode) where we set c as a constant. This calculation is used in the firmware to pick a sensible starting point for tuning so as to save time during the process. The control panel and keyboard consist of 3 control switches (for the vibrato, tuning mode and to activate automatic tuning) and the Stylophone’s keyboard. In honour of the original the keyboard is also based on a resistor network, however in this case there are two resistor networks which feed the input to two of the ATmega’s ADC inputs. 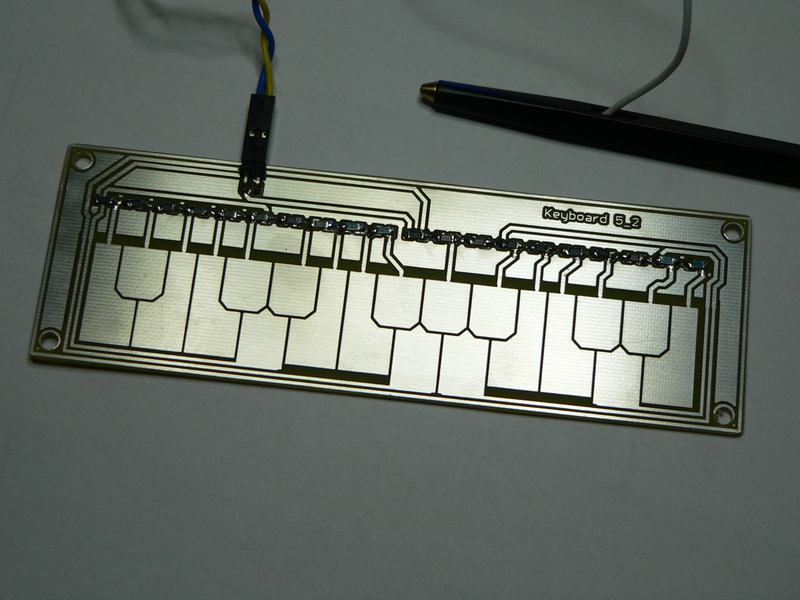 In the Eagle CAD file I created a custom part which is an exact representation of the original keyboard for the Stylophone to make producing a PCB much easier. The tin coating (which you can see in the pictures and video) was applied using Liquid Tin which makes the surface much more resistant to wear and scratches than a plain copper PCB. 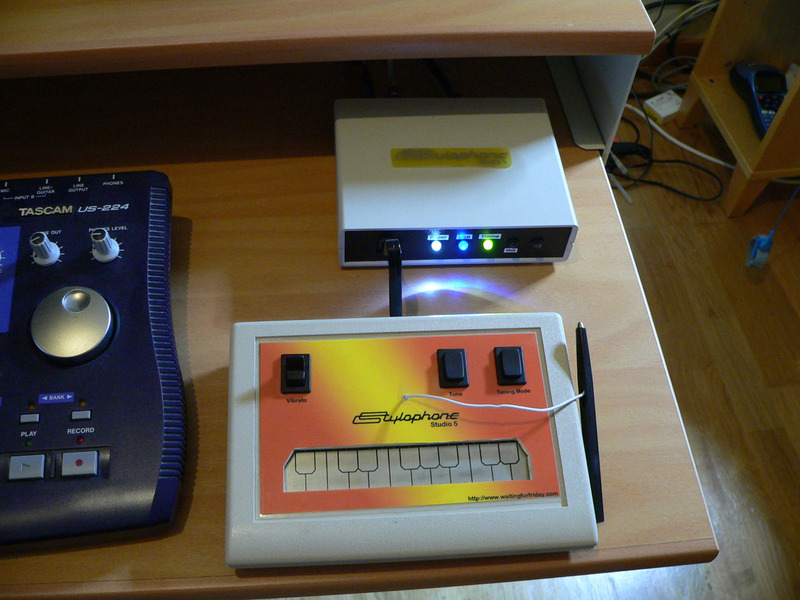 I also used much bigger switches to make it easier to play and control the instrument. The firmware code is fairly self explanatory and is heavily commented to aid reading and understanding. The only ‘confusing’ module is the note-stealing algorithm. Since the Stylophone is monophonic it requires an algorithm to deal with polyphonic events being passed via MIDI (more than one note on at a time). The note-stealing algorithm decides which note to play when more than one note is sent. It is basically a linked list which operates on a FIFO (First In First Out) basis, however it is a matter of taste and playing style when deciding how it should be implemented. I did it in the style that I felt most natural to me, you are, of course, welcome to dream up your own schemes. The firmware is designed to operate with or without USB connectivity. If USB is connected then all events are sent as MIDI out commands to the host. If the USB is not connected the Stylophone operates exactly the same allowing it to be used with out a computer connected. The firmware is provided as an AVR Studio 5 project and contains all the required source files for both the Stylophone and the underlying LUFA stack. The Stylophone Studio sound module is mounted in a Velleman G738 enclosure (and the PCB is designed to fit over the mounting holes provided). The keyboard is mounted in a PacTec KEU-7LP enclosure. The front panel for the keyboard was made by printing the required graphics onto glossy photo-paper (using an ink-jet printer). This was then laminated (using a normal office laminating machine) and then the holes for the keyboard and switches were cut. Once cut it was passed once again through the laminating machine before being glued in place on the front of the enclosure. 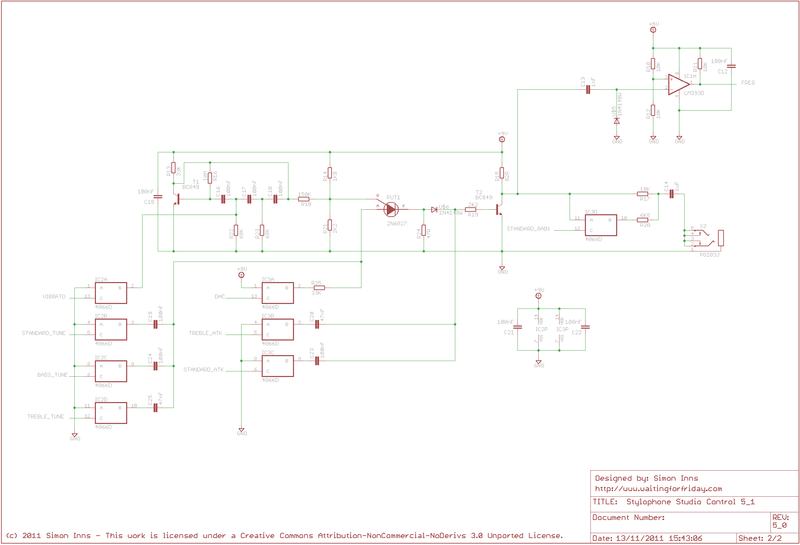 This zip file contains both the AVR Studio 5 firmware project and the Eagle CAD board and schematic files for the project.